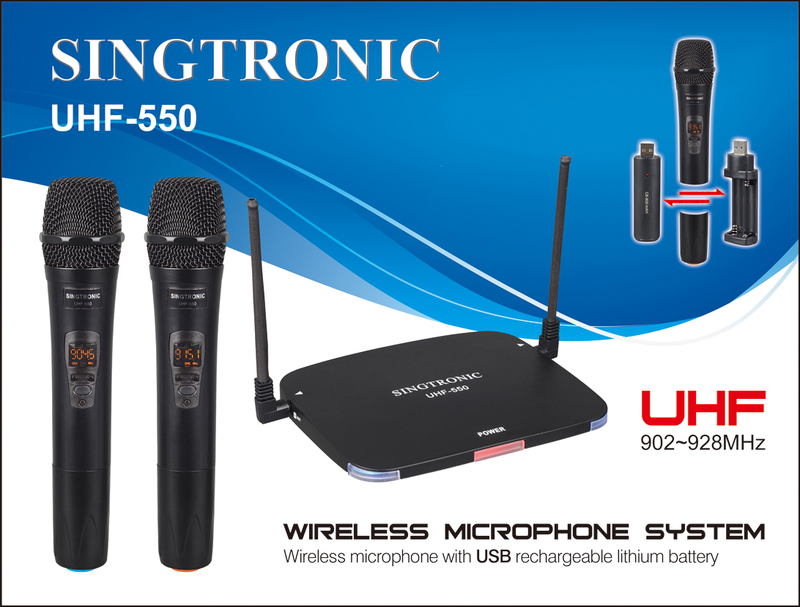 SINGTRONIC UHF-550 is a dual UHF wireless USB Lithium Rechargeable batteries microphone karaoke system. 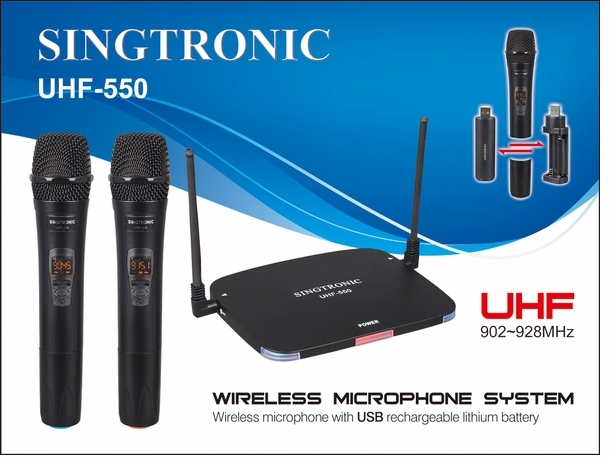 The UHF-550 professional wireless microphone system introduces a number of advanced technology and components, including the efficient low-consumption RF transmission technology, elimination of switching impact technology, slow changed output control technology, superb sensitive UHF narrowband receiver and etc.. EDA, online simulation accessorial design and strict quality control are applied to ensure each system with excellent electronic function. The system offers one 1/4" Mix output connectors provides the highest signal quality to your mixer or amplifier. Those make UHF-550 ready to be used at any time. Desktop receiver and enhanced muting, high signal / noise ratio. Almost zero noise output when standby. Broad frequency response range, super low distortion. No impact on switching receiver, ensure safety of rear stage amplifier system and speaker. Perfect operative status signals, fluorescence display, with digital microphone. Long practical distance. Over 30m in ideal circumstances; practical 20 m radius in complex circumstances. Dual frequency design. Be able to use two microphones at the same time without mutual interference. Applicable for medium& small stages, karaoke halls, and home entertainment etc.